Chanoyu has a history of 500 years. There are numerous kinds of beverages around the world. However drinking tea in the tea ceremony is the only time a beverage is consumed with the explicit intention of spiritual fulfilment. 'Wabicha' or chanoyu influenced by the aesthetic of wabi is a form of chanoyu influenced by the Zen thought of the middle ages. The father of wabicha was Murata Shuko, a Zen priest of the Muromachi Era. Shuko practiced poetry along with his Zen training and these pursuits influenced the way he conducted chanoyu. In Shuko's aesthetic sensibility towards tea he uses the term 'hiekaruru' or ‘cold and withered’. When people entertain guests, as a form of hospitality coffee and black tea are served after being prepared at a separate location away from guests. At times you yourself are entertaining, often tea is prepared by another member of the family or a waiter rather than by yourself. But chanoyu is the reverse. 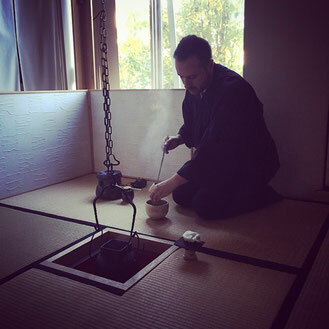 One of the main characteristics of chanoyu is that the host prepares tea by themselves, directly in front of guests. There is a special meaning is this conduct. If there was no special meaning, there would be no reason to prepare tea in front of guests. Knowledge required to conduct chanoyu covers a wide range of topics. The most essential knowledge required to conduct a chaji (tea gathering) is knowledge of the specific actions conducted by the teishu (host). 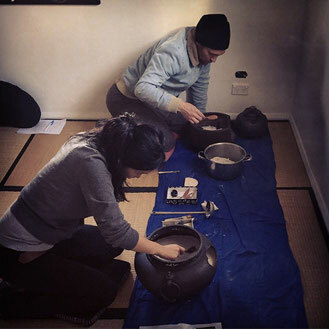 At the very heart of the teishu’s conduct is the temae (tea preparation ceremony). There can be no chanoyu without the temae. 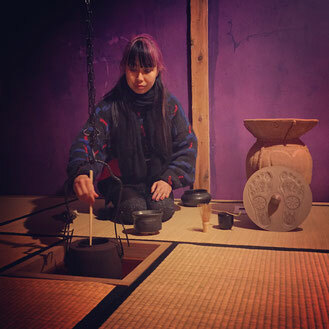 The ideal state for a host to achieve when performing the temae is the state of the body moving as one with the equipage (tea bowl, tea scoop, bamboo ladle, etc.). To move as one with the equipage you must not let your body slouch forward or manoeuvre the equipage with only your hands. As a fundamental of the temae, manoeuvring all equipage from the core of your body is of the utmost importance. Manoeuvre at the height of your navel, 3cm in from the end of your knees, and with your arms away from your side as if you have an egg under each arm. This is the relaxed, stable posture for which to handle tea equipage. Tea equipage is held firmly with the thumb and middle finger. The index and other fingers only give support to the item being held while the strength of the grip runs through the thumb and middle finger. The middle finger is directly connected to the central nervous system and is therefore the main finger to control things. When picking up and putting down things, you pick them up and place them down with your whole body, not just your hands. It is often said you ‘handle tea equipage from the lower waist’ (koshi in Japanese). This is because each movement starts, finishes and is controlled from the lower center of your body i.e. lower back and waist. Your eyes also follow the item being maneuvered and nothing else. It is because the equipage, your body and your eyes are moving together that your body forms a unity with the tea equipage. The temae of the Ueda Tradition is often described as beautiful with a sense of dignity and elegance. There are two reasons for this. First, the actions of the temae are composed of straight lines with no-waste i.e. all unnecessary movement is removed. This gives an invigorating appearance (e.g. folding of the fukusa (fukusa sabaki) and handling of the ladle (hishaku)). Secondly, many actions are performed together with the in-to-out flow of the breath (e.g. cleaning the whisk (chasendōji), rotating the tea bowl and whisking the tea). You will understand the importance of performing the temae in harmony with the breath if you continue dedicated practice. The fundamental of actions flowing from inside-to-out makes it easy for equipage to become one with the breath and the body. The two points of (1) invigorating, no-waste actions comprised of straight lines, and (2) the power emerging from actions performed in harmony with the inside-to-out flow of the breath, contribute to the dignified and beautiful appearance of the temae of the Ueda Tradition. The characteristic of chanoyu (more specifically, wabi cha) is bringing yourself to a spiritually tranquil state and reflecting on your true nature while partaking of tea. 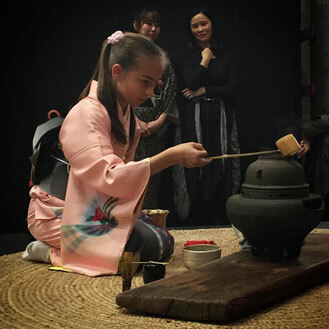 The art of chanoyu is built on the interactions between host and guest involved in the act of the host inviting guest(s), the host preparing a bowl of tea with heartfelt sincerity, and the guest(s) partaking of that tea. To achieve a spiritually tranquil state fit for preparing a delicious bowl of tea, there is no other way than repeated practice. In Sōko’s biography ‘Sōko Ōden’ is written ‘The ‘The enjoyment of Sōko’s chanoyu is to be found in the pursuit of purity and tranquillity’. And in the ‘Dialogues with Sōko’ is recorded Sōko’s sense of beauty favoured ‘utsukushiki’, a beauty of profound elegance. 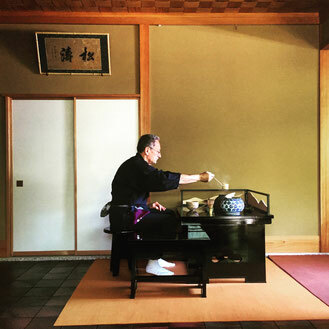 For us who are learning the Ueda Tradition of Tea, through our practice I hope we all develop an open mind, big heart, and reap a great sense of fulfillment from each day. May we practice Sōko’s chanoyu with this goal.